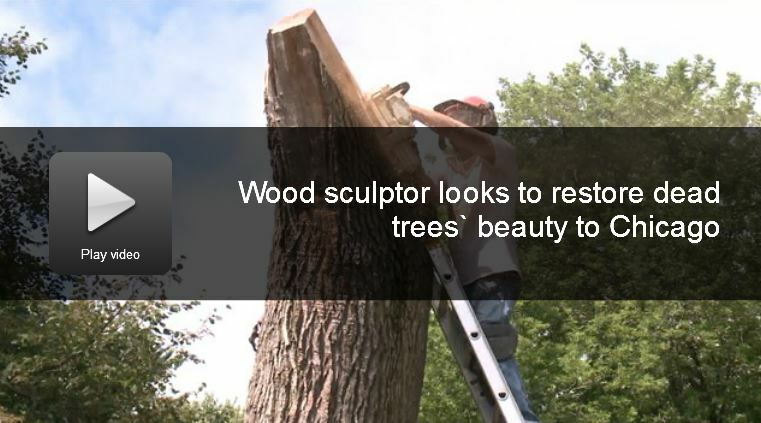 Sculptor Jim Long is just one of many who have begun to see the potential of urban wood in the Chicago area. WGN9 News recently reported on Long’s dedication for creating art out of this valuable community resource. For one of his most recent projects, Long brought his chainsaw and a ladder to Nichols Park in Chicago’s Hyde Park area. There he got busy sculpting an ash tree killed by the emerald ash borer into a howling wolf. Check out the video and accompanying article on the WGNtv site.. Check out the two sculptures Jim Long carved in Nichols park, a blue heron and the howling wolf. It is worth the journey.